The word “exploitation” has a simple definition. A worker is “exploited” when the wage the worker receives is less than the worker’s economic contribution to the firm. In the past I argued that there are players at top programs in men’s college basketball who are exploited. In my latest for Time.com, I extend the story to players at much smaller programs. Exploitation Is Everywhere in Men’s College Basketball argues that players at a school like North Carolina Central University are also worth more to their school than what they are receiving to attend to the university. The post notes that I have measured the productivity of the players on the schools I mention. I would add, I have also measured the Wins Produced of every men’s college basketball player back to the 2001-02 season (this is more than 50,000 player seasons). 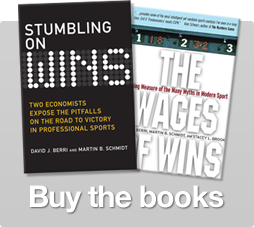 In addition, I have measured Wins Produced for both the WNBA and ABA. One should note that the models in each of these leagues is essentially the same as the model we see for the NBA. And the model we see for the NBA is remarkably stable over time. You can see this quite clearly when you do a simple out-of-sample forecast. To do this, we estimate the model for some sample of past years. You then plug in the values for a future season (numbers from outside the sample used to estimate the model) and see if you can explain wins in this future season. The results are that you do just about as well doing the out-of-sample forecast as you do if you just included the future season in estimating model. What this tells us is that basketball is basketball. This is a fairly simple game that demonstrates a remarkable level of stability over time. Of course, individual players in basketball — who are more consistent than what we see in baseball and football — can change their performance. But that is entirely a separate question from whether or not the Wins Produced model is stable over time and is stable in different leagues. Perhaps I will write more about out-of-sample forecasts in the future. I have seen people try and do this and it appears this idea is not entirely well understood. 9 Responses to "Exploitation in Men’s College Basketball"
I have said this before on theespnwatch. I envision college sports to be like any other major at a college. Since the same schools win, then there is a top tier of specialty schools (think Harvard Business) and other schools willing to invest in sports will do but will cut the ones that are not worth the investment. Theoretically, this would decrease the number of teams in a given sport. Thing is that just theory. Making it a free market actually “spreads the wealth” unlike what has been going on. The story of Marcus Lattimore is so unfortunate given he would have been a 1st round draft pick as a freshman if he was allowed to go pro thus not staying and possibly hurting himself. Looking forward to reading about out-of-sample forecasts, sounds like a very interesting topic! Is there a better way to put this? Seems like that sentence would also be true for eg coin tosses. Or I am misunderstanding something. Probably not the clearest sentence (happens when you write something in a few minute). Basically I am comparing two approaches. Take the entire sample and see how well you explain. Now split the sample. Estimate the model with earlier years. Then use that model to explain later years. If a model is stable, the out-of-sample forecast should give similar explanatory power to what you see if you include the later years in the model. That is very much the case when you estimate the Wins Produced model. It is very stable over time. This is only partially true. The marginal value of the employee also needs to be factored in. For example, pretend that an employee can generate $1 million/year is sales. It isn’t necessarily a bad deal if that employee makes 50k. If thousands or millions of others could yield essentially the same result if they were in the position, then in no way is the deal unfair for the employee since it is the resources of the company that are allowing the individual to achieve the majority of that success. In regards to College Basketball, fans primarily show up to watch their Brand, not the players themselves. For example, look at Wisconsin Basketball. Pretend Frank Kaminsky is worth 6 wins for the team (no idea the true number). If Kaminsky is not on the team, UW would still sell out every game and would receive pretty much identical revenue from its tv contract, concessions, ticket sales, etc. Contrastingly, if the entire UW and Iowa basketball teams decided to stop being “exploited” and decided to quit playing and form the Wisconsin SREGDAB and Iowa SEYEKWAH, I couldn’t even guess how many people would buy tickets to that, 50? 100? On the other hand, if UW and IOWA immediately handed out scholarships to D3 or whatever players to replace the defectors, thousands would suddenly become interested in these previously unknown D3 players simply because of the Jersey’s they wear. Not exactly how labor economics works. Sorry. Actually Dave it does and you are Blatantly Wrong, Sorry. “Labour economics seeks to understand the functioning and dynamics of the markets for wage labour. Labour markets function through the interaction of workers and employers. Labour economics looks at the suppliers of labour services (workers), the demands of labour services (employers), and attempts to understand the resulting pattern of wages, employment, and income. Wage differences exist, particularly in mixed and fully/partly flexible labour markets. For example, the wages of a doctor and a port cleaner, both employed by the NHS, differ greatly. There are various factors concerning this phenomenon. This includes the MRP (see above) of the worker. Trying to Pretend that Marginal Value does not Exist is highly Baffling. If you think every Salesman who can generate $1 Mil but only makes $50,000 is being exploited and should make near that 1 Million despite the fact that the sales person is readily replaceable by tens of thousands who could yield similar results then I do not know what to say. **More Fundamentally, you can Claim Kaminsky is worth $5 Mil but that is misleading since UW still almost assuredly sells the same number of tickets, collects the same TV money, etc even if Kaminsky were to be abducted by aliens tonight. Kaminsky in reality yields almost 0 extra income for UW this year. Exploitation means something specific. Sorry if you don’t know that. We are not talking about what determines wages. We are talking about how wages related to a workers economic contribution to the firm. And that is the end of the debate. Great Interview with Tom Farrer and Sonny Vaccaro on everything NCAA, exploitation, and summer youth basketball.